company culture – it has a profound and pervasive effect and it’s essential to consciously and deliberately nurture it. focus – doing many things badly rather than a few things well is surefire startup suicide. cognitive biases – the cognitive weaknesses of the human brain can if, unrecognized, wreak havoc. I’d argue that luck is an even bigger factor than any of these 3 but, by definition, luck is outside your control. Despite what you might like to think, your brain is not a rational, logical computer – you’re a human being. Your human brain has limitations. It has bugs. Cognitive Biases have been experimentally proven (again and again) to exist. Startups involve making a series of low-data, high-risk decisions. With limited data, Cognitive Biases have a stronger sway. People working on startups are often stressed and working long hours, making them more susceptible. The room for error is often very small because of limited funding runway. Startups are commonly started and staffed by younger people who have less prior knowledge to counteract the impact of Cognitive Biases. I believe that understanding and being aware of Cognitive Biases leads to better decision making and that better decision making, on balance, leads to better outcomes. …therefore, sleeping with your shoes on causes headaches! 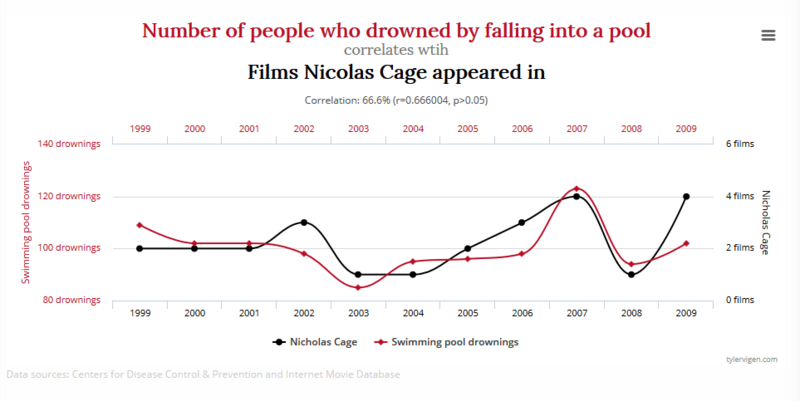 Of course it doesn’t; this is a classic example of confusing correlation with causation. In my experience, confusion between correlation and causation is rife in startups. Partly it’s the limited availability of data…but I’ve also seen that more data can actually make the problem worse. With so many metrics tools available, people tend to get lost in the data and miss the bigger context. Startups run at high speed and many things are changing in parallel, with little ability to control variables. For example, on several occasions I’ve worked to optimize conversion in a product funnel and been happy to see that the optimization worked, only to discover later that conversion improved due to an unrelated change elsewhere – e.g. positive media coverage. Confirmation Bias is the tendency to search for, interpret, favor and recall information in a way that confirms one’s pre-existing beliefs or hypotheses. More commonly, you might call it “cherry picking”. I think that Confirmation Bias is a particular problem for startups because they generally have a lot invested in a particular view of how the world should be (or will be) but have very little solid data to go on, especially at an early stage. Life at a startup is ambiguous; startups struggle and go through hard-times. Therefore, belief is often what carries a team through the tough times. Startup founders tend to be “true believers”, with a tendency to get high on their own supply. One aspect of Confirmation Bias is that it can maintain or strengthen beliefs in the face of contrary evidence. Always ask yourself whether you’re truly open to evidence that contradicts your existing views and beliefs. Startups regularly pivot but often pivot too late. Unfortunately, your confidence in your judgments is reliably greater than the accuracy of those judgments. You are overconfident. The real kicker is that this is especially true when your confidence is relatively high. Read that again: you’re probably wrong and the more confident you are that you’re right, the more likely you are to be wrong. One particular aspect of Overconfidence is what is referred to as the “Planning Fallacy” – most people who are involved in software development are probably familiar with it. The Planning Fallacy is the primary reason that software development projects are almost always late. The Planning Fallacy is the tendency for people to be overly optimistic in how much time will be needed to achieve a task. Counterintuitively, experience doesn’t seem to eliminate the problem – i.e. knowing that similar tasks have taken longer than expected doesn’t solve the problem. ask someone else – overconfidence generally only occurs when people are estimating their own tasks and disappears when people are estimating for others. So, never ask the person who will be performing the work how long it will take – ask someone else. Better still, ask a number of other people. In software development, a common technique is “Planning Poker” where a group of people provide blind estimates (so they don’t influence each other) of how long a task will take and the median is used. break tasks into smaller chunks – experiments have shown that the estimation for how long it will take to do a task is generally always less that the sum of the sub-tasks once they are broken out. “Group Think” is probably a term that most people are familiar with. My experience is that, in startups, it’s closely linked to the Confirmation Bias problem. As discussed above, startups are carried forward by true believers (founders) and dissent is often considered heretical. Minimize conflict – with a few exceptions, most people don’t want to fight. Hey, startups are stressful enough. However, there are sometimes necessary conflicts. Suppress dissenting viewpoints – startup founders are usually, almost by definition, very strongly opinionated and convincing. The flip side of this is that they tend – consciously or otherwise – to stifle viewpoints that contradict their worldview. Isolate outside influences – some startups have company cultures that are cult-like. While this may be very useful in getting everyone aligned on an objective, taken too far it is dangerous, leading to “not invented here” syndrome and hubris. Appeal to authority – startup teams must be encouraged to “speak truth to power” and call out the elephant in the room. It’s extremely hard to imagine what it’s like to not know what you know. i.e. you can’t “unknow” something. This is the Curse of Knowledge. In the context of a startup, one of the biggest problems is trying to put yourself in the shoes of your user or customer. The reality is that you can’t. You’re so deep into the problem that you’re trying to solve that it’s impossible to see it in the same way that an outsider would. This really underlines the importance of doing User Testing on your product using real users, not internal team members. Watching people unfamiliar with your business and the problem you are trying to solve use your product is always extremely revealing. There are always many implicit assumptions that you’ve made and these are only exposed through contact with real users. Anchoring is the tendency to rely too heavily on the first piece of information you get and a tendency not to adjust your position based on further evidence that contradicts it. Anchoring is what skillful negotiators – e.g. car salespeople – exploit to get the deal they want. The first price discussed tends to anchor the subsequent negotiation. In a startup, your first customer deal, your first hire, your first customer loss, etc tend to set a mental template for “how things work” with your business. It’s important to periodically ask yourself if you’ve become anchored in a world view that isn’t necessarily correct. You might call this “flogging a dead horse” or “throwing good money after bad”. Sunk Cost Fallacy is a tendency to continue to rationalize decisions and actions when faced with increasingly negative outcomes. A “sunk cost” is a cost that you’ve already paid and can’t get back – money that is already spent whether you continue or not. Sunk Cost Fallacy is, I think, one of the primary reasons that many startups pivot too late and end up running out of money. Being rigorously data-driven is probably the best antidote to Sunk Cost Fallacy (and other Cognitive Biases). Set specific metrics that need to be achieved by specific dates in order to assess whether a particular initiative or direction is working and hold yourself and your team to them. Attribution Bias is the tendency, when evaluating the causes of the behaviors of a person you dislike, to attribute their positive behaviors to the environment and their negative behaviors to the person’s inherent nature. We all have to work with people we don’t necessarily like. It’s important to realize that we probably can’t accurately understand others’ internal motivations and try not to take personally the behaviors that we consider negative. The Ostrich Effect is the avoidance of risky/difficult situations by pretending they do not exist. The “elephant in the room” is an obvious truth that is being ignored or going unaddressed. It’s critical to build a company culture in which people are encourage to call out the elephant in the room. If you don’t, you will be trampled by the elephant. “I knew it all along!” …actually, you didn’t. Hindsight Bias is our tendency to see an event, after it has occurred, as having been predictable. Hindsight Bias is a large and fascinating topic. I can’t possibly do it justice here. It’s unfortunately one of the hardest to counteract. The only known way is to ask whether or not alternate hypotheses and predictions would have been equally believable ahead of time. In reality, it’s likely that there were many other companies that did X but which don’t exist anymore…so you won’t be hearing from them. Survivorship Bias is concentrating on the people or things that “survived” some process and overlooking those that didn’t because of their lack of visibility. Survivorship Bias is one of my favorites simply because it is extremely common in Silicon Valley. Beware of people claiming that companies succeeded because of specific reasons without data showing that those reasons were in fact the reasons they succeeded. Lastly, we all tend to think of our own perceptions and judgments as being rational, accurate, and free of bias. In a sample of more than 600 residents of the United States, more than 85% believed they were less biased than the average American. This is despite the overwhelming amount of experimental evidence that they are not. Firstly, forget any idea that you can eliminate these biases – you can’t. However, you can educate yourself about them, build awareness in your team and encourage people to question themselves and call them out when they see them. Additionally, the #1 thing you can do to help counteract these biases in your startup is be Data Driven. Data of course does not solve all problems but, by asking the right questions and getting accurate answers, you can cut through many Cognitive Biases. Lastly, it’s important to note that these Cognitive Biases are subtle and pernicious. Companies do not usually fail because of one Cognitive Bias affecting one decision. Instead, the impact Cognitive Biases have is across a series of decisions over time. Be mindful. The best place to start for these and many others is the List of Cognitive Biases on Wikipedia. Good, bad or indifferent, please leave a comment. Thanks. excellent piece. i think we all have a day-to-day sense of these but seeing them in one place, succinctly summarized is very helpful. i primarily work in support so #5 resonates particularly. thanks. This is great – thanks for sharing.